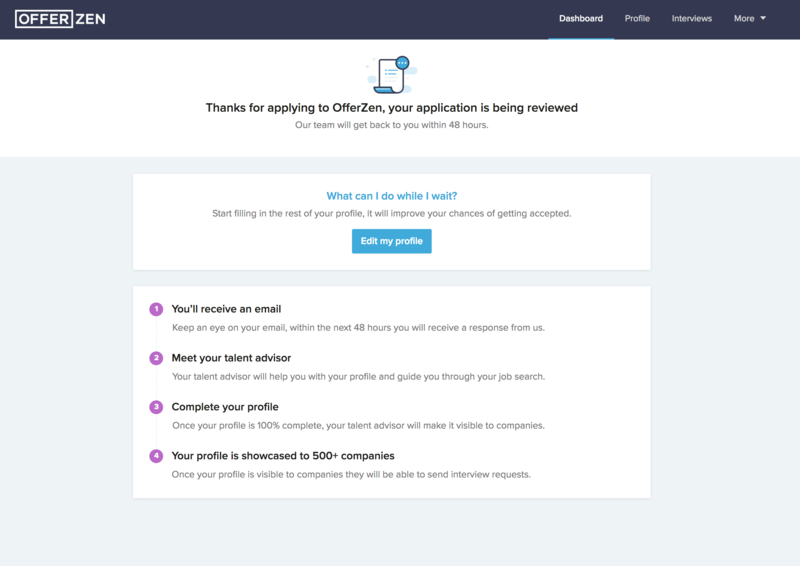 After completing signup you’ll be able to build your OfferZen profile. At this point only you and the OfferZen team will be able to view your profile. Check out the example profile and profile building guide when building your profile. 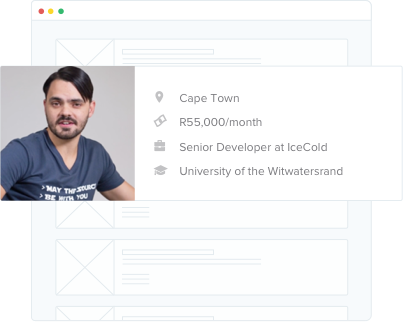 Once you've signed up to OfferZen, our team will look at your profile and see if your skills are currently in demand among companies hiring on OfferZen. You will be notified of the result within 48 hours. We recommend trying to complete your profile as it will improve your chances of being accepted. After being accepted you’ll be introduced to a talent advisor, who is there to help guide you through the OfferZen process. Your talent advisor can help you improve your profile, share insight into companies, prep for interviews, give advice on salary, and help you negotiate offers. Talent advisors are not paid on commission, and they will never pressurize you to accept any job offers. Their job is to make sure you have an awesome experience on OfferZen. 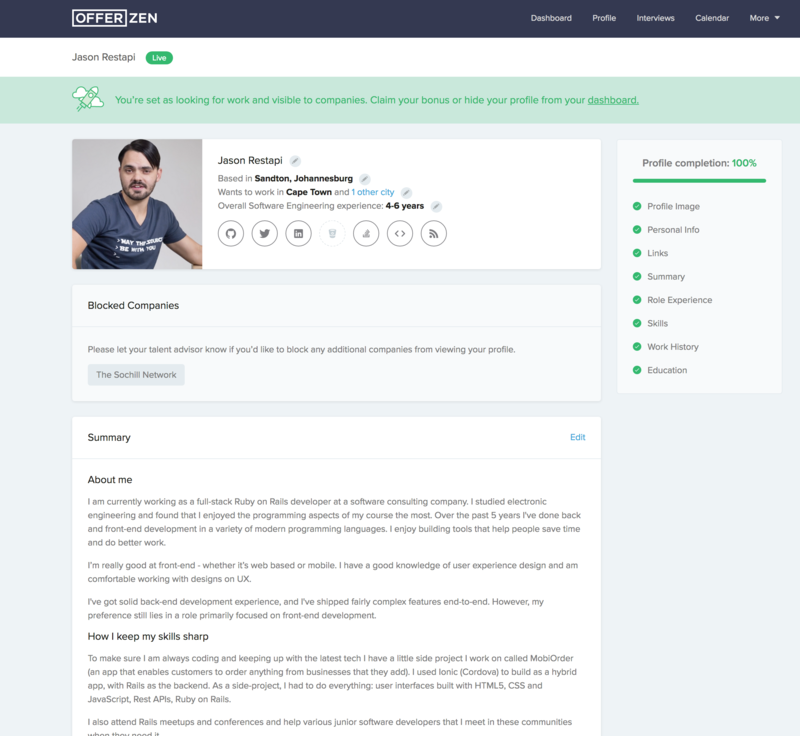 Only your talent advisor can make your profile visible to companies on OfferZen. When you are ready to have your profile made visible, your talent advisor will publish it on the OfferZen marketplace. There are currently 500+ companies using OfferZen to hire tech talent and we’re adding more all the time. We always hide your profile from your current employer and any others that you choose. Companies interested in you will request an interview. The interview request has details about the role as well as upfront salary info. The request also includes links to the company profile, where you can find details about the company’s tech stack, office photos and perks. Note: The upfront salary amounts in interview requests are non-binding and you’re still able to negotiate the final offer amount. You decide which companies to interview with by comparing salary, the work you’ll be doing, work environment, learning opportunities, and perks that companies offer. If you get a job through us we’ll give you R5000 and send you an awesome gift.